You may use the TR12-12PWF or the batteries listed below for the same application. The Tempest replacement battery provides 33% longer run-time than the Power Wheels battery. 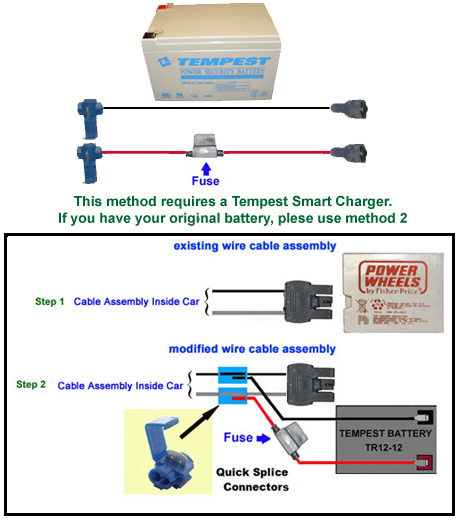 This Mod Kit comes with (1) 12Volt, 12Ah Battery, (2) 8 inch cables, (2) Quick splice connectors, and (1) In-line fuse. Length 5.94", Width 3.90", Height 3.74" (Total Height 3.98"), F2 terminals .250", Approx Weight 8 lbs.